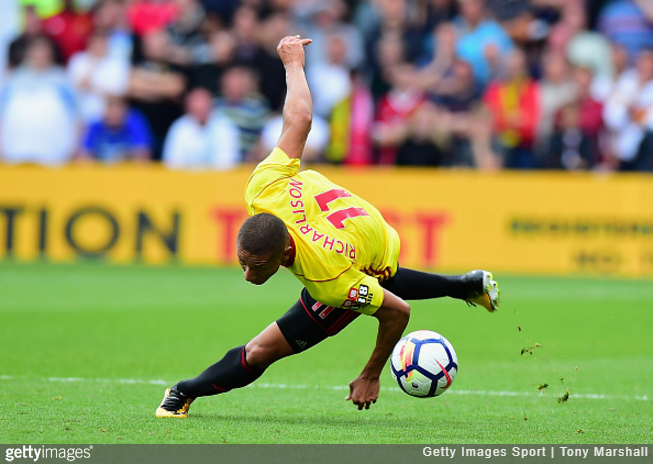 He may have only been at Watford for five minutes, but Richarlison has already become something of a fan favourite at Vicarage Road. The 20-year-old Brazilian striker scored the winning goal against Bournemouth on his debut last month, which is always a quick and easy way of lulling supporters into taking a instant shine. However, while he is most definitely aware of the existence of said chant, Richarlison – who is semi-officially being taught English by teammate Heurelho Gomes – hasn’t got the foggiest what the lyrics mean. The fans here are wonderful. I want to learn the song to sing it along with them. Their affection motivates me to play even better, run a bit further. I was very surprised by their reception, I don’t have the words to describe what the fans have done for me. I still don’t know (what the songs says), but they say my name several times. I need to grab Gomes to try and find out exactly what the fans are singing. The former Fluminense forward also revealed that he’s a huge fan of Elton John, which is rather handy as the revered pop behemoth also happens to be the honorary chairman of Watford Football Club. I hope to get to know him very soon, I still haven’t had the honour. I want to give him a hug. [Heurelho] Gomes says that Elton John always goes to games, that he likes to watch the players. He has a lot of love for the club, right? He is a musician and has a lot of love for Watford, so it’s okay to dream about a special song in my honour. It would be interesting, who knows! It is already a dream to be in England, in a club of Watford’s stature. I did not think twice when the offer from England came. I want to make history in Watford, and score lots of goals. Then, who knows, go to Borussia Dortmund. I’ve always talked about that in interviews and that’s a dream of mine that I want to fulfil. You heard the man: Lots of goals, special song from Elton John, then off to Dortmund. Certainly can’t fault the chap’s ambition.